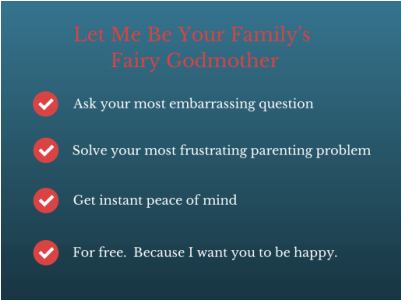 I'm Andra and I'm on a mission to transform your life with simple strategies to be a great parent and raise happy, well-balanced children without driving yourself crazy in the process. I believe that happy families change the world. Think about it. If you grow up in a home where happiness is the norm, chances are you are going to bring that happiness with you as you go out into the world. Being happy is contagious. Being stressed out is contagious. What state of mind do you want to create for your family? You are a smart, savvy mom. You know what the research says about raising smart, strong, kind children. And yet, sometimes you are so frustrated and overwhelmed you wonder if you are doing it all wrong. What if there is something critical missing from your parenting approach? What if just having the information isn't enough to protect your kids from bad choices and major mess-ups? (Yours and theirs.) How terrible would it be to wake up five years from now wishing that you had been a more effective parent, that you had been clearer and more confident in your ability to help your children learn to make good choices for themselves. Lucky for you, I'm here to help. I work with families just like yours. My work is sometimes with the whole family, sometimes just with one or both parents. Using an approach based on my years of experience as an education professor, mother and mindfulness instructor I can help you make sure that you are creating the lasting habits that will lead to success. For you and for your children. Give yourself the gift of confidence. Give your kids the gift of balance, kindness and self-control.